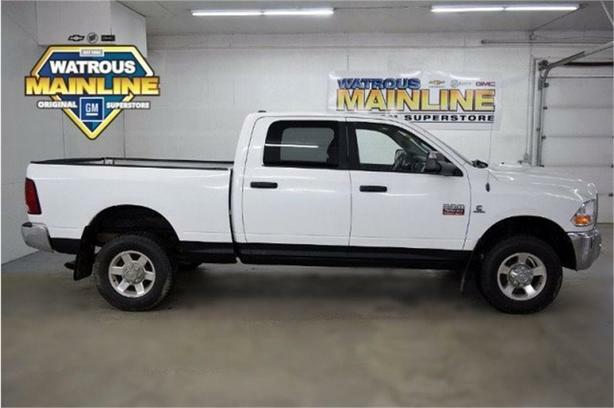 Look at this 2010 Dodge Ram 3500 SLT. Its Automatic transmission and Diesel I6 6.7L/409 engine will keep you going. This Dodge Ram 3500 has the following options: Four wheel drive, UCONNECT HANDS-FREE COMMUNICATION -inc: auto-dimming rearview mirror, iPod control, TRAILER BRAKE CONTROL, REAR WINDOW DEFROSTER -inc: rear fixed window, PROTECTION GROUP -inc: transfer case skid plate shield, LUXURY GROUP -inc: glove box lamp, auto-dimming rearview mirror, dual illuminated visor vanity mirrors, underhood lamp, rear dome lamp w/on/off switch, leather-wrapped steering wheel w/audio controls, overhead console w/universal garage door opener, LT265/70R17E ON-/OFF-ROAD OWL TIRES, DARK SLATE/MEDIUM GRAYSTONE, CLOTH 40/20/40 SPLIT BENCH SEAT -inc: 10-way pwr driver seat, driver pwr lumbar, front centre seat cushion storage, 115V aux pwr outlet, rear 60/40 split-folding bench seat, BRIGHT WHITE, and 6-SPEED AUTOMATIC TRANSMISSION W/OD -inc: 3.73 axle ratio, aux trans oil cooler, tip start. See it for yourself at Watrous Mainline Motor Products Ltd, 208 1st Avenue East Box 70, Watrous, SK S0K 4T0.